The mission of the Boise Art Museum is to create visual arts experiences that engage people and inspire learning through exceptional exhibitions, collections, and educational opportunities. To be a vital partner in the educational, creative, and cultural life of our communities as an innovative leader in local, regional, and national visual arts. Boise Art Museum is a 501(c)(3) non–profit, educational and charitable organization. The mission of the Museum is to create visual arts experiences that engage people and inspire learning through exceptional exhibitions, collections, and educational opportunities. On December 3, 1932, The Boise Art Association, Inc. (now Boise Art Museum, Inc.) became a non-profit corporation in the state of Idaho to be in perpetual existence for the purposes of creating in the minds of residents, an increased appreciation for the Fine and Applied Arts, to receive gifts and bequests for the use and benefit of this corporation, and to acquire and maintain a suitable gallery in which works of art could be displayed. The Boise Art Association, Inc. was given space in the Carnegie Public Library in which to display its art exhibitions. The aims of the association were educational and cultural in character, and its exhibitions of paintings and other works of art were generally available to the public for a small admission charge, meant to defray expenses. The Boise Art Association, Inc. operated in the Carnegie Public Library until it raised the funds to build the Boise Gallery of Art, which opened in 1937 in Julia Davis Park on Boise Parks and Recreation land with labor provided by the Works Progress Administration. Through this partnership with the city of Boise and the Works Progress Administration, The Boise Art Association, Inc. moved the Boise Gallery of Art program and operation to the new building in 1937, at which time it used the building exclusively as a museum for the display of art objects and for incidental art purposes. Among the exhibitions showcased at the Boise Gallery of Art were Idaho artists and others in exhibitions entitled: Chiura Obata, Japanese Artist; Puget Sound Artists; The American Show; Seattle Fuller Collection; Corcoran Biennial; California Watercolor Society; Interpretive Stencils from American Federation of Art; Disney’s Snow White Celluloid Cuts; One Hundred Years of Photography; Hokusai Drawings; Diego Rivera Original Paintings, Guggenheim Collection; Chinese American Art; Latin American Art; and Guatemala Art; among others. In 1961, The Boise Art Association, Inc. expanded its stated mission through amended Articles of Incorporation to include but not be limited to the receiving and expenditure of principal and interest to promote the well-being of mankind by charitable, educational, literary endeavors and publications to the end of encouraging the development of artists and interest in art by establishing leadership efforts in art and art education through the Boise Gallery of Art. In the mid-sixties, exhibition programming became more ambitious. The need for additional space quickly became a priority, and The Boise Art Association, Inc. raised the funds to begin a year-long expansion program in 1972. The building re-opened to the public in 1973, and The Boise Art Association, Inc. changed its name to The Boise Gallery of Art Association, Inc. Exhibitions during that time included Muralo Painters; Navy Combat Artists; Artists of the Western Frontier; Andre Derain; What is Modern Architecture? ; James Castle; Siamese Stone Rubbings; Josef Albers; Frederic Remington and Charles Russell; Art of the Navajo Weaver; Edward Kienholz; Goya’s Quinta Del Sordo; Yoshiko Takkawa; Realism and Surrealism in American Art; Three from Montana; Albrecht Durer; Rembrandt Van Rijn; Norman Rockwell; Kathe Kollwitz; and Fritz Scholder, as a sampling. In 1986, the institution successfully completed another fundraising campaign to support a second renovation for expansion of its galleries. 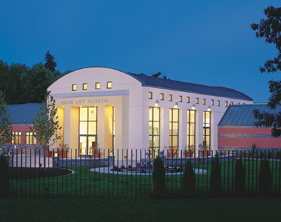 In 1987, The Boise Gallery of Art Association, Inc. changed its name to the Boise Art Museum, Inc. and the organization became known as the Boise Art Museum. This name change corresponded with the award of initial national accreditation by the American Alliance of Museums (AAM). National accreditation certifies that the Boise Art Museum meets or exceeds national standards in all areas of operation including the Permanent Collection, education programs and exhibitions. BAM continues to be accredited by AAM, is the only collecting art museum in Idaho, and within a 300-mile radius, to hold AAM accreditation and is among 4% of museums nationwide that have earned this distinction. The following were among those featured in exhibitions at BAM during this time: Glenn C. Janss Collection; Morris Graves; Milton Avery; Red Grooms; Reginald Marsh; James Lavadour; Folk Treasures of Mexico; Pre-Columbian Art; Italo Scanga; Kerry Moosman; Ansel Adams; David Airhart; Lone Start Art; Max Peter; Geroge Catlin; Robert Henri; John Takehara. In 1997, the Boise Art Museum, Inc. embarked upon a multi-million dollar campaign, supported by the city of Boise and the community, to increase its facilities to a total of 34,800 square feet. Since that time, BAM has served the community with high-caliber exhibitions from its Permanent Collection as well as with borrowed works of art along with a full accompaniment of related educational programs. A selection of artists and exhibitions include: Rodin; Holocaust Diary; Orthodox Treasures of Siberia and North America; Greek and Roman Art; Contemporary Latino Art; Fay Jones; William Wegman; James Castle; Alice Neel; Picasso Ceramics; Kumi Yamashita; Watercolors and Pastels from the National Gallery of Art; The Art of John Fery; Marilyn Lysohir; Renda Palmer; Gregory Barsamian; African Art; Kerry James Marshall; Paintings from the Hudson River School; Dale Chihuly; C. Maxx Stevens; Hung Liu; Patrick Dougherty; Imperial and Folk Art of China and Japan; Gary Hill; Masterworks of Egyptian Art; Matthew Barney; Pat Steir; The Fickle Nature of Bubbles, Spheres and Inflatable Objects; Edgar Degas; Georgia O’Keeffe; Hildur Bjarnadottir; Deborah Oropallo; Frank Lloyd Wright; Japanese Woodblock Prints; Ted Apel; Scott Fife; Kendall Buster; Chuck Close; Laura McPhee; Faith Ringgold; Marsden Hartley; Lead Pencil Studio; Jun Kaneko; Devorah Sperber; Gee’s Bend Quilts; Dorothy and Herbert Vogel Collection; Wanxin Zhang; John James Audubon; Shoes Tell Stories; Nick Cave; Billie Grace Lynn; Wilfred Davis Fletcher Collection; Kahn & Selesnick; Kehinde Wiley; Kara Walker; Arp, Miro, Calder; Liu Bolin; Paul Vexler; Origami; Adonna Khare; Charles Burchfield; Wendy Maruyama. BAM is embracing its 80+ year history as an opportunity to enhance and ensure a rewarding experience for all visitors through exhibitions, collections, interpretive strategies, educational programming, a welcoming environment, and a commitment to being a vital part of the educational, economic and cultural life of the community.